Sometimes you can read a comic and not notice a few details until the 369th read (or 370th if you like round numbers). Case in point - New Warriors Vol1 #27 - one of those rare Infinity War crossover issues with an actual plot to it. 'Dark Speedball' is laying waste to Robbie's hometown of Springdale, Connecticut. As Rob bounces to stop his evil twin, his policeman father unknowingly moves against his own son, blaming the masked marvel for everything wrong in his community. If only "I haven't done anything!" had've been "Don't have a cow man" that would've been priceless - less subtle, but priceless. 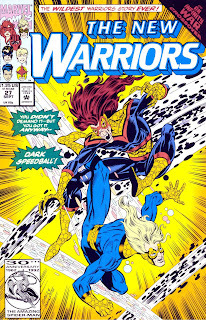 Who knows if writer Fabian Nicieza or artist Darick Robertson thought of bringing the two Spring-towns together for a visual gag, but whoever it was, I wish they had also talked the editor into letting 'Dark Speedball' keep his name off the cover too. Finding the guest menace being named 'Blackball' in the actual story, stole a truckload of shine. 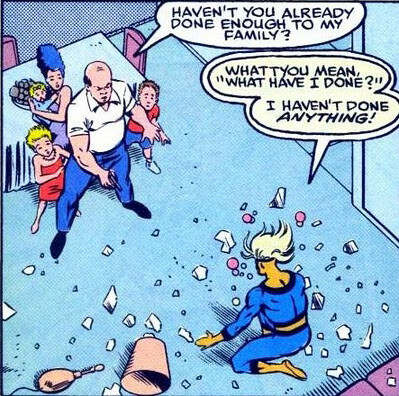 I mean it's DARK SPEEDBALL! It sells itself. Haha! Cool, I do love those kindsa tributes - and that was a scoop that they had an actual "real Simpsons" type thing way back then. SameArron - I think the first one I spied was like a one panel drop of a guy who looked like the Joker in a Spider-man comic, telling police officers a joke. I was instantly like why isn't this on the cover? Joker in Spider-Man! Stupid lawyers. Wreck all the fun.